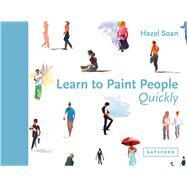 From intimate portraits to bustling crowds, this practical guide by bestselling artist Hazel Soan teaches budding painters how to paint people . . . in just a few hours! For many of us, learning to paint is a lifelong aspiration—and popular artist and writer Hazel Soan distills the information that matters most into this essential guide. Best of all, even beginners can master her techniques—which include proportion and perspective and using different media—quickly. Soan’s simple exercises and step-by-step demonstrations explain how to depict people in a variety of poses and settings, insert them into already-existing paintings, and place them into a variety of scenes, from city streets to idyllic beaches. Hazel Soan is a popular and successful artist who divides her time between London and Cape Town, exhibiting her work widely. She has her own gallery in Fulham, London; is the author of eight bestselling books for HarperCollins; and has made several successful DVDs. Hazel was one of the art experts in the popular Channel 4 TV series Watercolour Challenge. Her successful books include Learn Oils Quickly, Learn Watercolour Quickly, Essence of Watercolour, and Watercolour Rainbow (all published by Batsford).